Today, Minority Rights Group International (MRG) and the Roma Democratic Development Association, SONCE have launched a ground-breaking study of the realities confronting Roma in Macedonia. Twelve Roma mediators in six different municipalities have interviewed hundreds of Roma to gather fresh information and paint a complete picture of the inequalities, institutional discrimination and social prejudice facing Macedonia’s Roma population. 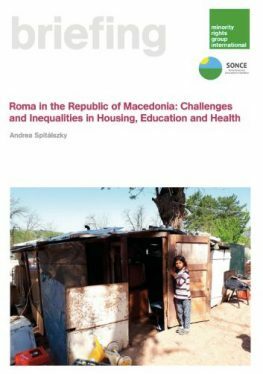 The results of this research have been compiled in the briefing “Roma in the Republic of Macedonia: Challenges and Inequalities in Housing, Education and Health”. The mediators have collected the most serious examples of Roma exclusion in Macedonia, ranging from the risk of statelessness to the causes of the significantly lower average life expectancy among Roma (68 years) compared with the average of the national population (73,5 years). Other issues revealed by the results gathered by the mediators include discriminatory access to services, for instance the barring of Roma children from swimming pools and the exclusion of Roma from restaurants, coffee shops and hotels. The briefing, published in English, Macedonian, Albanian and Romani, has been produced in cooperation between MRG and SONCE. It makes numerous recommendations to the Macedonian government and local authorities. The briefing focuses on three key areas in which Roma continue to experience profound discrimination: education, housing and health. Education: many Roma children have to attend segregated classes, or they are physically separated from their non-Roma peers; according to the research, this phenomenon appears to be on the rise. Poverty is a further barrier to education: many Roma parents do not have enough money to buy new clothes, shoes or school materials for their children. And for poorest Roma households with no access to the running water, the discrimination and hate speech their children meet in the schools and while travelling lead some parents to choose to not send them to protect them from bullying. Housing: many Roma families live in houses with less than 5 square metres per person; around 80,000 Roma households are lacking long-term housing solutions. Health: Roma women often live in remote settlements without any access to public transport; they are not sufficiently informed and regularly discriminated against by medical personnel. Therefore, many of them do not visit their registered gynaecologists during their pregnancies and in some cases give birth in their homes. The briefing highlights the deeply worrying example of a relocated group of Roma, after a the flood, which happened in the Roma settlement in one of the municipalities in the country, which had to settle in a former hospital building. They were forced to sleep on the floor, with no rubbish containers, leading to garbage accumulating in the yard; as a result a number of children have been infected with illnesses. Without electricity or running water, children were not able to clean themselves and stopped attending their school. The local authorities promised to find a solution, but no steps have been taken so far. Increase the number of health mediators in municipalities where there is a high density of Roma, with more resources to support their work. Roma Democratic Development Association SONCE is a non-governmental organization working at the local, national and international levels to promote civil integration, democratic rights and equal opportunities for Roma in the Republic of Macedonia.